Salinas, Calif. – Dino Crescentini looked to be set for the repeat in today’s 45-minute, 30-lap event at Mazda Raceway Laguna Seca, as the overall and Diamond class pole sitter led from the green flag. But a tangle with a lapped car coming to the white flag allowed Competition Motorsports’ David Calvert-Jones to take the position and his second win of the season in Race 8 of the Pirelli GT3 Cup Trophy USA Championship. In contrast to the event at Mazda Raceway Laguna Seca three weeks ago, both Race 7 & Race 8 were run entirely under green flag conditions. 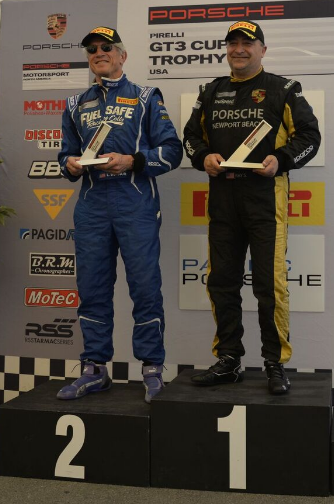 The 25 drivers in all five classes battled throughout the event with exciting racing from start to finish. Crescentini, running his own team with his son and two friends working on the car, put his No. 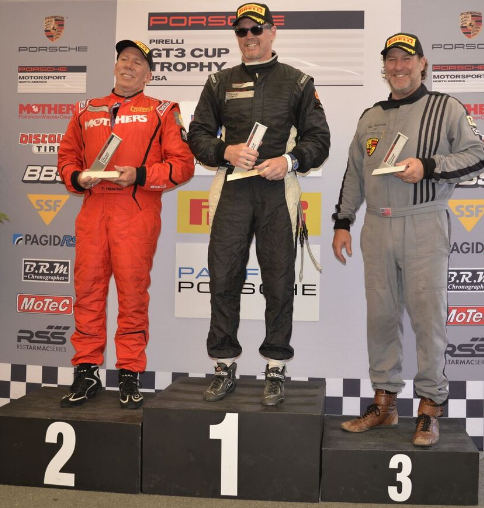 34 Porsche GT3 Cup Car on the pole position in morning qualifying and once again showed no signs of relenting the position. Meanwhile, Calvert-Jones enjoyed a spirited fight with hometown team BR Racing’s Robert Todd, with Todd spending much of the race filling Calvert-Jones’ mirrors. But as the field headed to the white flag lap, Crescentini ran afoul of a lapped car in Turn 3, getting the worst of it with extensive damage to the left side of the car. Calvert-Jones passed Crescentini, who was able to nurse the car home in second position, with Todd third. 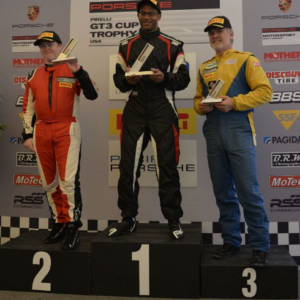 Phil Fogg, Jr. earned his second Platinum Class race victory in only his second event since October, albeit with more adventures than he experienced on Saturday. Two separate incidents caused damage to his No. 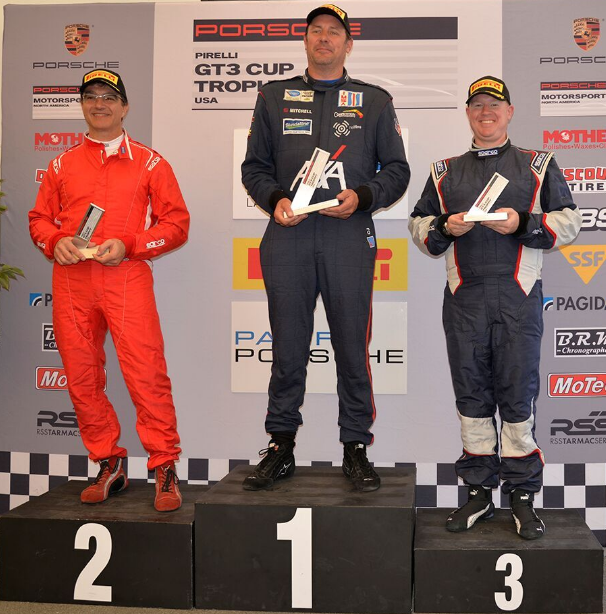 5 TruSpeed AutoSport Porsche GT3 Cup Car but he was able to nurse the car home in front, with teammate Tom Haacker second in the Mother’s Polish Porsche and GAS Motorsports’ Rob Tachovsky coming home in third. 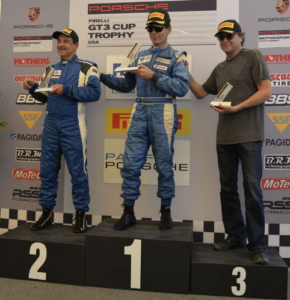 Ray Shahi once again earned the Platinum Masters Class victory over TruSpeed AutoSport teammate Larry Schnur. Shahi enjoyed battling with the other Platinum class cars, keeping his No. 65 Porsche Newport Beach entry in the thick of the class fray. The Silver Class was competitive from top to bottom, with multiple position and lead changes. Kevin Woods started his No. 94 BR Racing Porsche Cayman GT4 ClubSport at the back of the field after recurring brake issues sent him into the tires during qualifying. He picked off the competition one by one as the class spent much of the early going running nose to tail. Sean McAlister of Competition Motorsports, who entered the Mazda Raceway weekend as the championship leader, came from fifth to finish second, with Pacific Porsche/Competition Motorsports pilot Carl Tofflemire third. After mechanical issues kept him off the podium in yesterday’s race, Competition Motorsports’ Steve Goldman came into Sunday’s event with something to prove. He started his No. 1 Porsche Cayman GT4 on the Silver Masters class pole and didn’t look back, taking the wire-to-wire victory to mark his sixth of the season. Teammate Chris Vivolo took his second podium of the weekend in second, with Mike Sullivan third to round out the all Competition Motorsports Silver Masters podium. 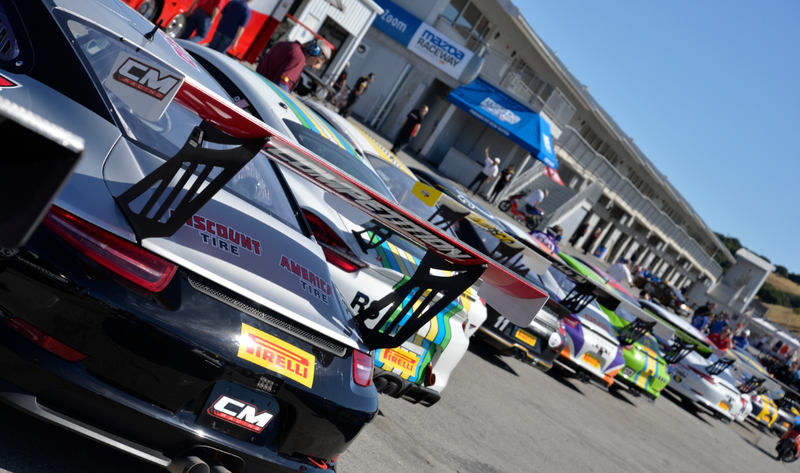 Pirelli GT3 Cup Trophy USA President Greg Franz was pleased with the weekend action and proud of all the progress made by the teams and drivers since the previous event at Mazda Raceway Laguna Seca three weeks ago. This entry was posted in News on June 5, 2016 by admin.